Over the past month, I have been trying to make a little more time for myself; it's never been something I have easily achieved, but the more pregnant I get, the more I am aware I need to make time to stop and relax. The more I talk to my friends with kids the more I become aware that soon my time won't be my own. Give it a few years, and I'll have a little one wanting to follow me around everywhere, which as lovely as it sounds, also can get a little testing at times I am sure. With this are the forefront of my mind, I have been making time, one hour a day to be exact to soak in a sea salt bath, light a candle, drink a herbal tea and listen to some music or a podcast. It's effortless but to be honest, the simple pleasures are the ones I love the most. Depending on how I am feeling will determine whether I have a bath early morning or right before bed and I tailor my sea salts to suit my mood. 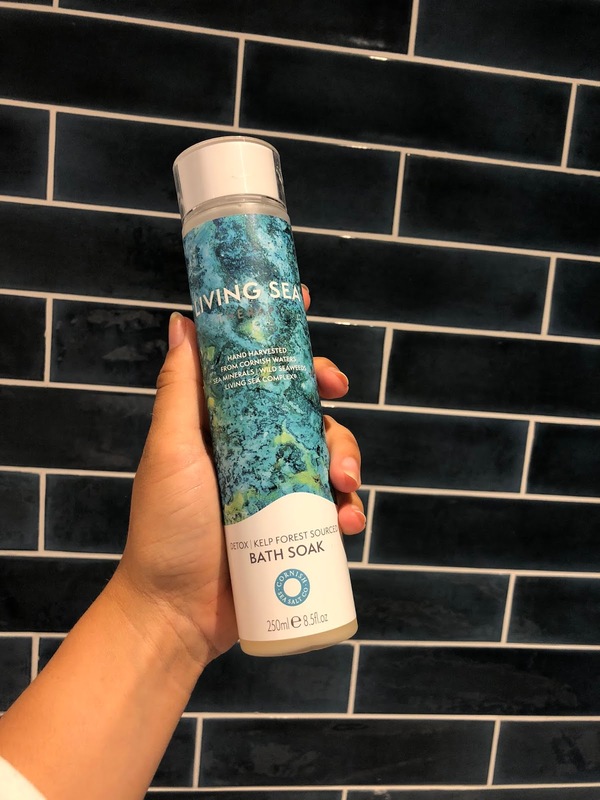 First thing in the morning I want to awaken my body, while still feeling relaxed, so I opt for the Living Sea Therapy Energising Bath Salts with a splash of their Bath Soak. Both combinations together are so lovely and teaming that with a peppermint tea and a great podcast. I have loved the Mum Talk Podcast by the lovely Emma Jaulin. It's been teaching me a lot about pregnancy and motherhood and an absolute must for any pregnant ladies. If I am going for a late night bath, then I go for the Living Sea Calm Sea Salts, again with their Bath Soak. Then team this up with a freshly brewed Camomile tea and some relaxing music, I love Ben Howard's new album, and incidentally so does the baby. Whether you're pregnant or not I urge you to take 1 hour a day to yourself, to relax, exercise, awaken your senses or just shut off from the world. I feel like it has done be a world of good and it's funny to think that before I felt like I never had the time, but as soon as you consciously make the time you can do anything. Here are the products I recommend and if you wish to shop them pop the code CE10 into the basket for a discount off all orders over £20.